Lannon Elementary School was recognized at the State Capitol in Madison for being among 11 high-achieving and high-progress schools in the state. 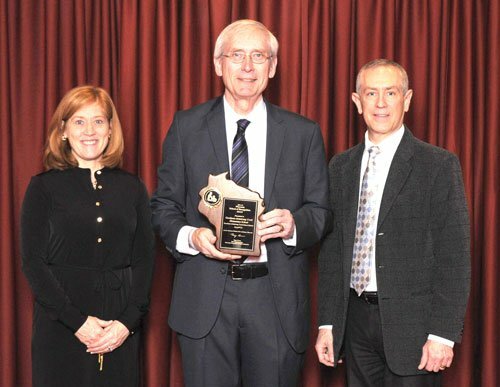 The recognition was part of the Wisconsin Title I Schools of Recognition awards ceremony in which four categories of awards were presented to 169 schools. Schools were recognized for being high-achieving, high-progress, beating the odds or earning school recognition in the program for five consecutive years. As a high-achieving and high-progress school, Lannon met all annual measurable objectives for achievement, demonstrated high achievement, fell within the top 10 percent of schools experiencing growth in reading and mathematics, and had achievement gaps less than three points between student groups or showed evidence of reducing gap,. State Superintendent Tony Evers welcomed Lannon third grade teacher Jodi Bowe and principal Richard Ladd to the recognition event. “These awards recognize the work of students and their parents along with teachers, school administrators, and school staff members to break the link between poverty and low academic achievement. These efforts will help us ensure that every student graduates college and career ready,” Evers said.